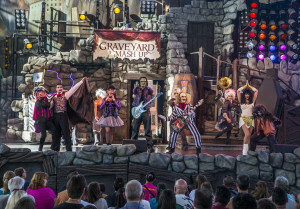 Universal Orlando Resort is introducing a brand-new version of the popular, live Beetlejuice stage show featuring the classic Universal Monsters and “the ghost with the most” – Beetlejuice, Beetlejuice, BEETLEJUICE. The new show, Beetlejuice’s Graveyard Mash-Up, is now open at Universal Studios Florida. Guests of all ages will be invited to the party of the year at Frankenstein’s castle, where they’ll dance along to remastered classic rock hits performed by their favorite monsters. The high-energy show will feature an all-new storyline, rock-n’-roll music mash-ups, set enhancements, pyrotechnics and two new monsters – best friends Phantasia, a music-loving master of the turntables and relative of the Phantom of the Opera, and Cleo, an urban chic descendant of The Mummy. For more information on Universal Orlando Resort, visit www.UniversalOrlando.com. This entry was posted in Home Page, Home Page Slider, News and tagged Beetlejuice's Graveyard Mash-Up, Universal Orlando Resort. Bookmark the permalink.